I have written many posts about antisemitism because it is so infuriating. Lies about Jews and Judaism and Israel spoken with authority, such that one is easily deceived. Here is a brief history by Victor Davis Hanson, a classicist and historian with the Hoover Institution at Stanford University.that I am reprinting so that you can never say that you were not warned. Antisemitism is a form of senseless irrational hatred towards Jews couched as truth. And that is the infuriating aspect of it that it is no longer politically incorrect to espouse antisemitic views, longstanding irrational hatreds against Jews. What are these irrational ideas about Jews? Is it true that all blacks are lazy? Is it true that all Jews are rich? that Jews control the media and US foreign policy. That jews are treacherous and disloyal? That Jews kill Christian children to use their blood to make matzo on Passover? Many people in the world in the past and the present espouse these beliefs about Jews. If Jews are so rich and so powerful, how did Hitler manage to murder 6 million of them in such a short space of time? and what is this obsession with Israel described as an immoral, apartheid driven genocidal entity? Why did an obscure academic organization called the American Studies Association recently vote to endorse a resolution calling for a boycott of Israeli universities. The self-appointed moralists were purportedly outraged over the Israeli government’s treatment of Palestinians. Given academia’s past obsessions with the Jewish state, the targeting of Israel is not new. Yet why do the professors focus on Israel and not Saudi Arabia, which denies women the right to drive and only recently granted them the right to vote? Why not Russia, which has been accused of suppressing free speech, or India, which has passed retrograde anti-homosexual legislation? The hip poet Amiri Baraka (aka Everett LeRoi Jones) recently died. He was once poet laureate of New Jersey, held prestigious university posts and was canonized with awards — despite being a hateful anti-Semite. After Sept. 11, 2001, Baraka wrote a poem that suggested Israel knew about the plan to attack the World Trade Center. One of his poems from the ‘60s included this unabashedly anti-Semitic passage: “Smile, jew. Dance, jew. Tell me you love me, jew … I got the extermination blues, jewboys. I got the hitler syndrome figured.” Yet that did not preclude The New York Times and National Public Radio from praising him after his death. Trendy multicultural French comedian Dieudonne M’bala M’bala is known for his anti-Semitic provocations and for making a gesture that has been described as an inverted Nazi salute. He recently quipped of a Jewish journalist: “When I hear him talk, you see … I say to myself, gas chambers … a pity.” Auschwitz is now a joke? Not only do people talk of it as a joke, they say the Jews are using the Holocaust for personal gain, and even lying about its extent. Several years ago, David Irving, an English historian was convicted of libel in an English court for publishing that there were no crematoria at Auschwitz and that the murder of 6 million by the Germans is greatly exaggerated. Sadly it was the Germans themselves who were so sure of the correctness of their hatred towards jews that they kept careful records of their evil deeds. Antisemitism has existed since ancient times because the Jews have always been different, adhering to their own peculiar laws, and always a minority among world powers such as Rome, Egypt and Persia. As Christianity gained ascendance over Rome, the church was obsessed with negating Jewish theology and demonizing Jews. Mohammed also had to explain why Jews did not accept his prophesy. And so he compares them to apes and monkeys and antisemitism is used to fuel Arab hatred away from their despotic rulers. Real life Jews and Israelis have multiple identities and multiple attitudes towards the state of Israel, towards the Jewish religion but the anti-Semites paint all Jews and Israel with the same negative brush. Oh and yes even some Jews agree with them. Even that does not make their mythical fantasies about Jews true. What is true is that immediately after the Holocaust, it became politically incorrect to express antisemitic thoughts or ideas. Sadly since about 1995, it has become more and more fashionable and even politically correct to express hostility towards Israel, to question its right to exist, to smear it with a Nazi and genocidal apartheid label and we see the rise of antisemitic attacks on Jews and their property and their human rights to dignity. 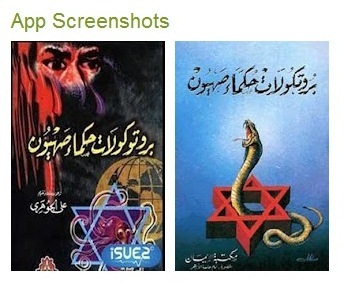 We see these thoughts and ideas propagated on the internet and in books and films and Youtube videos and also in rising antisemitic attacks on Jews and their property, all over the world. It is this acting out that is most worrying. We see the extent to which antisemitism has become politically correct in the responses to Harper’s visit to Israel in Canada in the Canadian papers. Many of them were shocked and disappointed by his support of Israel asking whether his stance was “balanced”. He is the only world leader who has grasped the insidious nature of the Arabs’ hatred of Jews, and how that is what is keeping a state of war alive between Israel and the Arab population: a hostility that Israel has been contending with since it inception during the war of 1948 and 1967 and the continuing violence against Israel which the Palestinians have not abjured. to this day. It is hardly anti-Semitic to focus on problems between Israel and the Palestinians, or even to pressure the Israelis. It becomes so, however, when problems elsewhere are simply ignored, and Israel alone is singled out to be chastised. The record of the United nations vis a vis Israel amply demonstrates this. I have the statistic but I won’t bore you with them. Has the United Nations ever focused on the 13 million Germans who were ethnically cleansed from Eastern Europe about the same time that thousands of Palestinians left what became Israel? Would the American Studies Association boycott Chinese universities over the absorption of Tibet? Is the world really troubled about divided capitals such as Jerusalem? If so, why not an international conference on the Turkish occupation of a divided Nicosia on Cyprus? Can’t Mr. Kerry use shuttle diplomacy to settle who owns all those disputed rocky islands that have led China and Japan to the brink of war? Nazis and racists in our time, spearhead Jewish hatred, based on ancient crackpot defamations that date back to the Jewish Diaspora in Europe since the Roman destruction of Judea. “ lately, anti-Semitism has become more a left-wing pathology. It is driven by the cheap multicultural trashing of the West. Jewish people here and abroad have become convenient targets for those angry with supposedly undeserved Western success and privilege. Aside from the old envy, and racial and religious hatred, I think cowardice explains the new selective anti-Semitism. Mr. Kanye West would not dare slander radical Muslims, given the violence and threats against European cartoonists and filmmakers who have dared to create work perceived as insulting to Islam. The American Studies Association would not call for a boycott of Russia despite its endemic persecution of homosexuals. After all, Russian President Vladimir Putin is as unpredictable as Israeli politicians are forbearing. Mr. Kerry is not rushing into Damascus to stop the bloodletting that has claimed far more lives than all the Palestinians lost in 70 years of conflict with Israel. Syrian President Bashar Assad, Shiite terrorists and al Qaeda would not listen politely to Mr. Kerry’s pontificating sermons. What is to be done about it? We need to talk about it and expose it as we are doing here. Silence is aquiescence and we dare not be silent. We know where that leads. Ask not for whom the bell tolls: it tolls for thee. by Victor Davis Hanson, a classicist and historian with the Hoover Institution at Stanford University. And this was just published: It says the same truth, only more bluntly. Antisemitism is an “industry of lies” that are reported as truth. The Industry of Lies is about antisemitism today: one of the greatest frauds of recent decades – a fraud of historic, even epic, proportions. When almost half of all Europeans believe that Israel treats the Palestinians just like the Nazis treated the Jews, when leading politicians assert that the Arab-Israeli conflict is the central cause of violence in the world, and when prominent intellectuals argue that Israel is an apartheid state, the unfortunate reality is that the lies are winning. As a result, Israel has become the devil incarnate in the eyes of many otherwise good and reasonable people – people who genuinely want to see peace but inadvertently contribute to the continuation of the Israeli-Arab conflict. The tragedy is that they are neither helping the Palestinians nor promoting agreement or reconciliation. Instead, they lend legitimacy to the most fallacious claims of the most extreme activists, thereby empowering radicals who have no interest in attaining peace. Israel is not free from flaws. 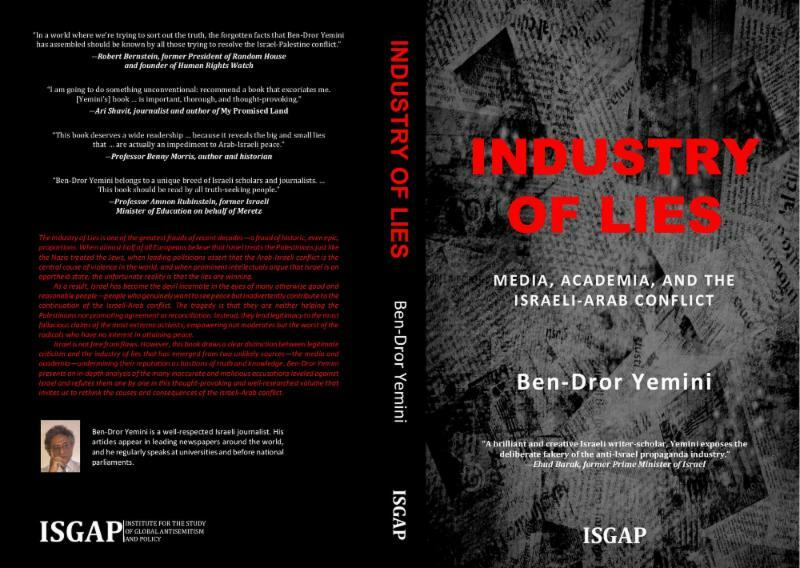 However, this book draws a clear distinction between legitimate criticism and the “industry of lies” that has emerged from two unlikely sources – the media and academia, undermining their reputations as bastions of truth and knowledge. Ben-Dror Yemini presents an in-depth analysis of the many inaccurate and malicious accusations leveled against Israel and refutes them one by one in this thought-provoking and well-researched volume that invites us to rethink the causes and consequences of the Israeli-Arab conflict. Last week I attended the CIJR sponsored talk by Moshe Kedar in Montreal. The title of the talk is Israel at 70. Prof. Kedar actually explains how Israel became Israel and then brings us up to date regarding the current state of Israel in the Middle East. His is an optimistic picture based on the ideas of a historian and an insider of the Israeli intelligence apparatus. To skip the introduction start watching the video at 9:25 min. And for those who wonder whether peace is worth fighting for and whether it is even possible, I offer this gift: A choir of thousands which got together in a huge stadium to sing together on the occasion of the 70th anniversary of the declaration of the Independent State of Israel. The dividends of peace are available to all of us all over the world if we only cooperate together for the sake of peace: A stadium full of Israelis young and old singing together a hymn of gratitude – “All Kol Aileh” For all of these, the honey and the bee sting, the sweet and the bitter….The song actually has English subtitles – A prayer for Peace and its dividends. I am writing this one day after President Trump cancelled the JCPOA/Iran Nuclear Agreement. In spite of the intransigeance of Iran and the tragedies unfolding today in Syria, Sudan, Yemen and Gaza, I dare to believe and we must all continue to hope and pray and work for an umbrella of peace that will cover all the world speedily and in our time. 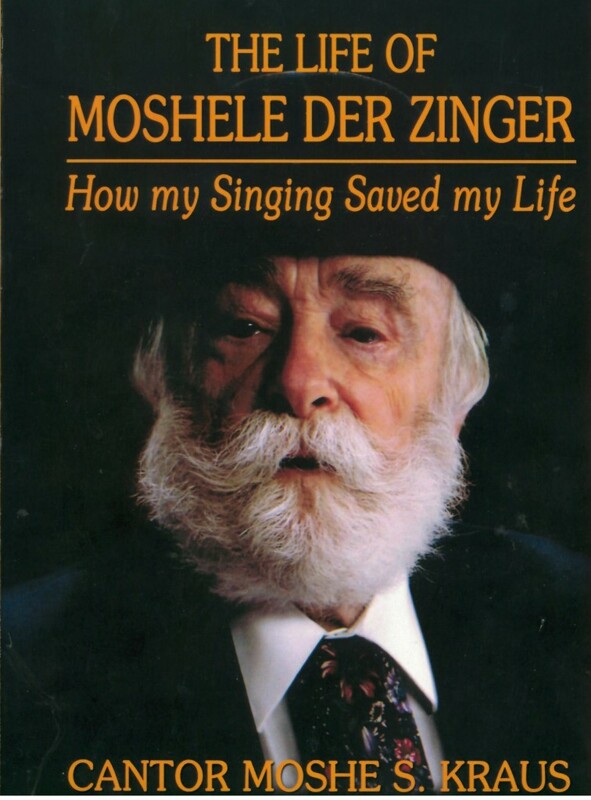 Pastor Rudy Fidel and his wife Gina were so impressed with Cantor Kraus’ memoir of his life experiences “Moshele: Der Zinger: How My Singing Saved My Life”, that they organized a week of events for Cantor Moshe Kraus and his wife to speak in Winnipeg. I accompanied them on this trip as part of my work to create a documentary featuring Cantor Kraus’ life story which has many twists and turns. On Wednesday, September 12, 2017, Cantor Moshe Kraus, age 95, spoke to a gym full of students at Shaftesbury Public High School. The event was followed and broadcast on the CBC evening news that same evening. And here is the story which he shared with the students on that day. This morning I was musing about Chanukah and the great unprecedented events of our time, the recent death of Vaclav Havel of Czechoslovakia and Kim Yong Il of North Korea with my Mormon trainer, Steven. Yes, my trainer Steven, is a committed and practicing Mormon. We train and we talk twice a week. This morning it was about the unexpected death of Kim Yong Il, the North Korean “Great Leader”, the starvation and virtual imprisonment of the North Korean people who are dominated by a well fed and well armed military. North Korea is the world’s most militarized nation, with a total of 9,495,000 active, reserve, and paramilitary personnel. It is a nuclear-weapons state and has an active space program. (wikipedia) and this led us to think about how the few enslave the many via ideology all over the world. Jonathon Kay writes, Kim Il-sung knew that the only way to legitimize his repressive, impoverished regime was to insulate subjects from the outside world (the dials on North Korean radios are soldered so as to lock them in permanently to the state propaganda network) and to turn himself into an ersatz deity. Over 500 statues of Kim Il-sung dot the North Korean landscape, and a revisionist history of his days as an anti-Japanese guerrilla fighter have been embellished to the point that they seem like something out of a 1980s-era Arnold Schwarzenegger film. It seems the pen is mightier than the sword and both sides know it. So what does this have to do with Chanukah? I share with you this video that lays out the background of the Chanukah story. Chanukah is the story of the weak and the few against the strong and the many. However there is another important lesson that we learn from this video and the Chanukah story. The lesson of knowing what to fight for. The Macabees were fighting the ideology of the Greeks which conflicted with the human rights articulated by the torah. This is what gave them the courage to fight because they understood that fighting for these principles was more important than life itself. Vaclav Havel, who fought against the same kind of enslavement as in North Korea by the former Soviet Union, on the other side of the world, and won, understood both of these issues. And after he succeeded in freeing his people, he is quoted by Irwin Cotler sharing this important truth, “those who would repress the human rights of their own citizens will threaten the rights of the citizens of other countries.” We are seeing this manifesting all over the world, in Syria, Iran, where tyrants are willing to fight to the death to buttress their own power, they endanger all of us with their power and their arsenals. None of us have crystal balls regarding the future, but the story of Chanukah reminds us to light the candle, and not give up the struggle. 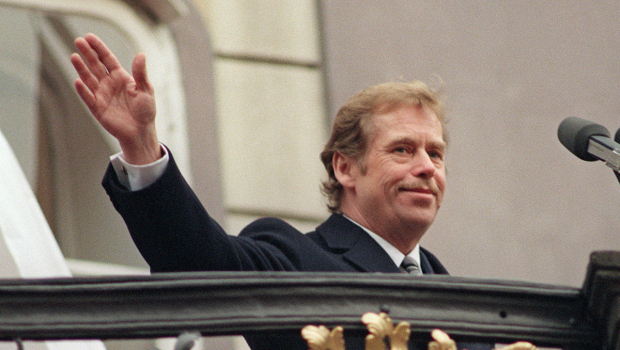 Again I quote Vaclav Havel, the only lost cause is the one we give up on before we enter the struggle. Let’s light those candles, remind ourselves why we are lighting them, and take courage from the victories of those who have shown the way. 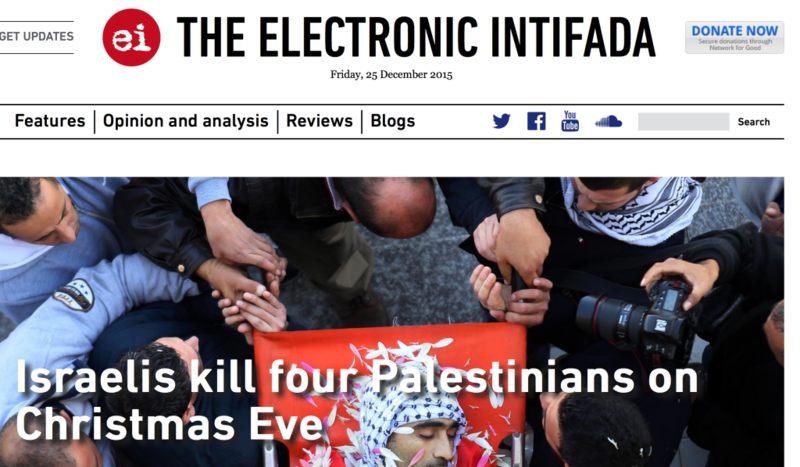 The fake news coming out of the Palestinian Media and their supporters is often not at all reported or recognized in the Western Press. 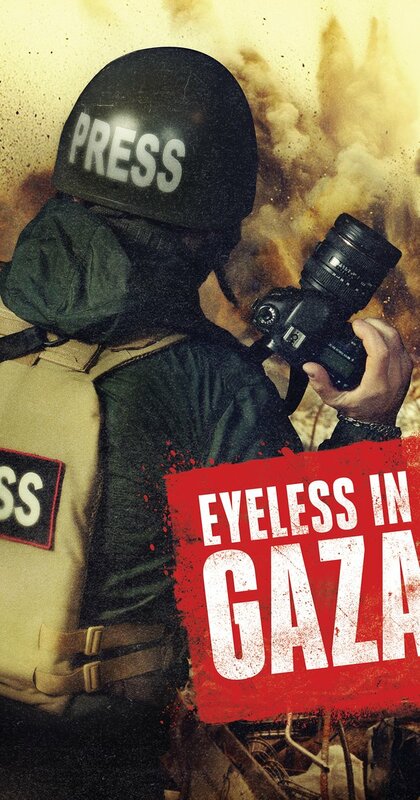 A worthy documentary on this subject Eyeless in Gaza was recently released. I happened to catch it when it was screened by the Student Society of St.John’s University, Manhattan, NY. The film reports that “In reporting the Gaza War of 2014, these quotes appeared in the international media: “They’re calling it a massacre”, “Children and civilians comprised the vast majority of the 200 killed”, “All innocent people. All of them civilians”, “Israel is targeting a number of different places including hospitals.” This information formed international opinion yet all the above quotes are in this documentary clearly shown to have been influenced by the systematic intimidation, threats, torture and persecution of journalists in Gaza, of both local and Western media.The producers interview Palestinian civilians and journalists, Hamas leaders, UN officials, military analysts and Israeli spokespeople to arrive at these troubling conclusions. The film is now available on I-tunes for sale or rent. I challenge you to watch this documentary and share it with your colleagues. finally we have a name for this kind of “news”. And just to further prove my point about the repressive tyranny that is currently going on in Gaza. I just saw this article about refugees fleeing Gaza not because of Israel but because of What the Gaza administration is perpetrating on its citizens. Benny Morris, an Israeli historian, was the darling of the anti-Israel left for supporting the Arab narrative about the Palestine creation myth in 1948. In this lecture, an update of his views presented on Thursday November 12th. 2016, at McGill University, in addition to describing both sides of the war, the players and their motivations, He asked the question: “Was the war by the Arabs against the establishment of the State of Israel (1947-1948) in the area that was called Palestine during the governance of the English Mandate, an Islamic Jihadi war?” He has uncovered evidence that it was. He has uncovered broadcasts from the Allimah of Al-Azhar University, one of the the highest Islamic authorities, calling for a Jihad against the Jews immediately after the partition announcement in the United Nations. At the same time, he pointed out how the armies that were unleashed against the nascent State of Israel, in addition to their Muslim anti-Jewish motivations, each nation fighting Israel had its particular agenda. Israel alone was fighting for survival. And this is why she had the absolute motivation to win at all cost, and did win her battle for survival. This war of 1948 which was long and brutal is called by israeli historians, the Israeli war of Independence. This lecture brought out the largest audience ISGAP has ever had at Mcgill. Hecklers showed up prior to the lecture objecting to Prof. Morris giving his talk. They shouted loudly and we were not sure whether he would be able to speak, but finally they were persuaded to leave. After the talk there was a lively question period. 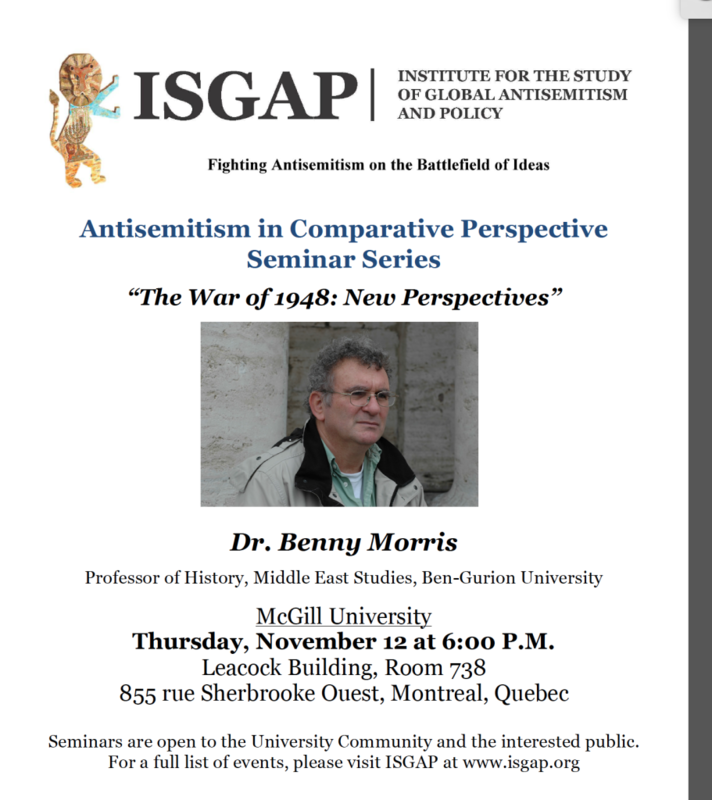 One question that I found very interesting was a question from someone, who could have been a professor, asking Why ISGAP, the Institute for the Study of Global Antisemitism invited Benny Morris, a professor of Israeli history. Unfortunately Israel’s history then and now on college campuses everywhere is filtered through the lens of Jew-hatred. Even though critics of Israel love to proclaim that “criticism of Israel is not antisemitism”. The BDS movement’s focus on destroying the Jewish State is very close to it. And this person’s objection to even hearing the scholarly talk of a historian speaks for itself. And by the way, Benny Morris has been vilified by both sides for his historical analysis and it is a credit to the Institute that they invited him to speak. I am writing this a day after the Horrific Paris attacks. As I listen to the CBC and BBC all still appear to be confused by the attacks. 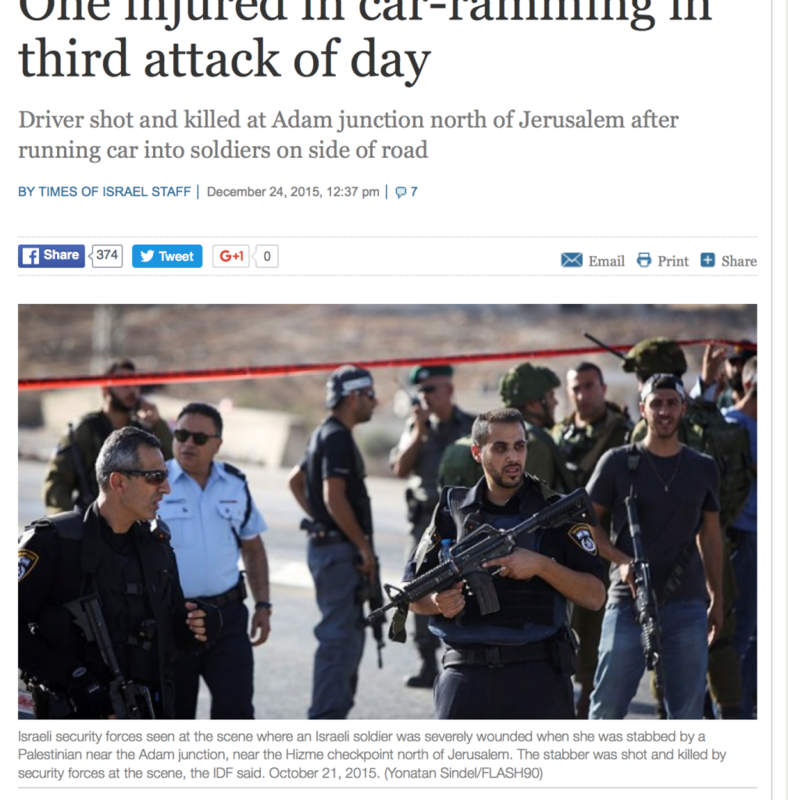 Israel has been dealing with this kind of terrorism since its inception and even today the mainstream media is not reporting the hundreds of attacks perpetrated in Israel by the Palestinians, inspired by their Jew baiting, Israel baiting Imams. Over 609 attacks have been documented in Israel during the months of September and October of this year and even today we received news of a murder of a father and a son attacked in their van. This article says it best How Many More Wake-Up Calls. And here is a post if you needed any more confirmation about the antisemitic, anti-Israel incitement that goes on everyday over the internet. Fortunately we now have organizations like PAL WATCH – Palestinian Media Watch who are there to document and expose these purveyors of hatred towards Israel and Jews everywhere.